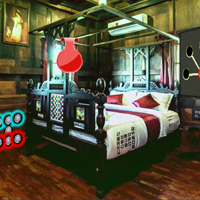 G2R New Country Room Escape is another point & click escape game developed by Games2Rule. In this escape game, someone trapped you inside this New country room. You need to escape from there by finding useful objects, hints and solving puzzles. Good Luck and have fun! I see a pink green orange hint and a pink green orange puzzle but no idea what to do with either?? Is anyone here? I need some help please? NVM figured it out. Nice game. Why do they put a load game button if it does not work???????? both WOW and G2R ???? think i found a bug...in the puzzle next to the 212 31 clue, one of the pieces is missing so i can't solve the puzzle. There should be a total of 12 pieces in that puzzle. I had all of them, no problem. I lost a piece too. I had to restart and make sure I clicked on a blank space before a star. The first time, I clicked on a thin star and it apparently changed places with an item in an etherworld.